We have had our Bar Crusher 610C (now 615C) for just on four years and we cannot speak more highly of this craft. It is all we have wanted and then some. We can fish comfortably both in rivers and out at sea. 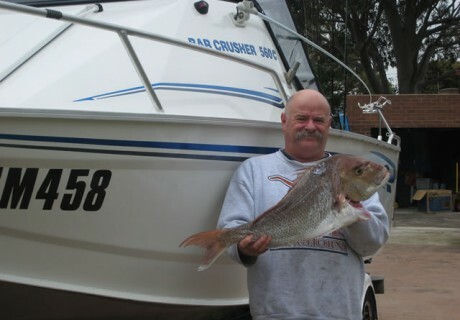 The ride is second to none, beating our previous boat (Southwind) both for ride and fishing area. We have tested this boat on more than one occasion in rough seas and at no time did we have difficulties in managing the boat. This included fishing out of Eden, on the Continental Shelf (some 49km from shore) and having to return in what could only be classed as a very bad storm. The boat handled this storm with ease. We have also crossed many bars, such as Lakes Entrance and Narooma. Although we picked the right weather conditions, we know even if the weather does pick up we have the confidence to know the Bar Crusher will return safely. As for Bar Crusher the company, we can’t speak more highly of both the advice and service given by all members of their staff. No matter how small or large our query, it has always been answered quickly and efficiently and most times with a smile. Since purchasing our Bar Crusher, I have recommended this boat to several friends, who on my advice have purchased one of their own and have nothing but praise and thanks for that recommendation. Thank you to Bar Crusher and the crew. Our next boat will be a bigger and better version of this craft.